It’s fair to say that over Christmas formal meal planning went out of the window. We had lots of family over on a number of different days so I felt like I was perpetually putting out food on the table for people to dig into and in between we were winging it in terms of meals (although this sausage and apple tray bake did save my skin on Christmas Eve when I realised I’d planned meals over Christmas but nothing for Christmas Eve). I’ve been having a bash at calligraphy / brush lettering over the last couple of days. I’ve wanted to teach myself for years but couldn’t find a local workshop so I decided to just teach myself. 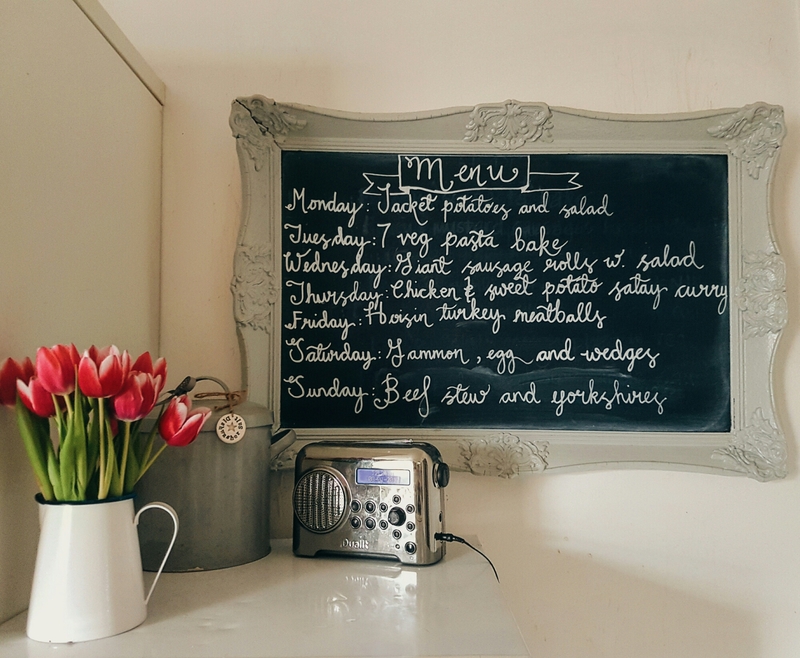 I started last night and thought I’d have a go at the chalkboard today so if you can’t read it I apologise!!! The hoisin turkey meatballs are from Dean Edwards Feelgood family food book which I’ve recommended before. Other than that, we had a massive joint of beef which my in laws bought intending for us to eat it over Christmas but there was so much food we split it and put it in the freezer, hence the beef stew – left overs from today’s roast! I’m nothing if not resourceful. The 7 veg pasta sauce I found on @amandagrant_com on instagram and its a variation of a recipe I use already. I’ll try and be a bit more regular at posting the meal plan. Let me know if there’s anything else you’d like to know or would find useful. As always it’s great to have your feedback.